Usher's, that's our new obsession. At least recipe-wise. Lots more to come. You'll be begging for us to stop. What have we learned so far? 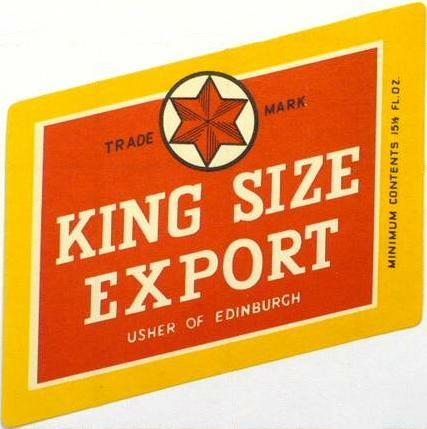 That Scottish brewers could be weird. Today's recipe is a good example. I've never seen an English Pale Ale even vaguely like it. 19th-century English Pale Ales were simplicity itself: pale malt, loads of hops, optionally some invert sugar. Not like this beer at all. You'd certainly never find black malt in an English Pale Ale. The chances of brown malt being in there are even less. The black malt must be there for colour. Especially as it's being added to the copper and not the mash tun. I've no idea at all about the brown malt. "I have mentioned Richdale's knack of producing beers to suit the customer simply by changing the name or colour of a standard brew; they confined their variations to single figures. Jim Collinson found that at Heriot [John Jeffrey & Co.] they had gone much further, for he discovered they had no less than 117 different coloured beers, to meet the historical requirements of their free trade customers, and the help of memory men within the brewery was essential to ensure each customer got his variation; plus, of course, a massive amount of administration and manual labour. He set about reducing the colours to three - dark, light and twilight - and found to his considerable surprise that the brewery received not one complaint from the trad when it was done." "The Brewing Industry 1950-1990: Reflective Essays 1950-1990" by Anthony Avis, 1996, page 73. 117 variations in colour. That's beyond crazy. How on earth could any brewer keep track of that? Colouring a Pale Ale dark - where have I heard of that idea? It'll never catch on, I'm sure. Time for Kristen to make his magic . . . . . Grist – Really neat grist setup on this one. A few pale malts and then a good bit of brown malt plus the same bit of black malt into the kettle! I used Golden Promise for the main base and then some good Canadian pale malt. I was toying with the idea of using some Maris Otter but that has a nice honeyed biscuit twang to it that I wanted to avoid. I really only wanted to avoid it because I wanted to see how the brown malt played with all these tasty hops. Turns out, it really plays well. The dryness and the toast really remind me of a sort of really hoppy Ofest/Vienna-type thing. The black malt same as the Usher’s 1885 IPA. Micronize it up, dump it in the boil. Hops – Same hops as the 1885 IPA with a little more and different breakdown of them. A bit more in the dry hop but you get the idea. Because the hops are the same I wanted to do a little experimenting with some similar hops. I used Cluster for the bittering again. They are really good for the purpose of being elbowing in the palette…bitter and cheap. Really though, any hop that has a moderate alpha acid level and a bit on the harsh end can be used. For the aroma and dry hops I decided to go with Mt.Hood. So why Mt. Hood? My good buddy Ted Hausotter wrote up a great article in the November/December 2011 edition of Zymurgy called Hop Experiment: American vs. German Hops in Pilsners. He did a great job of experimenting and comparing the results of US vs German hops. He gives a comparison with Hallertauer Mittlefru and a few US hops, how he used them and how they compared. He gives a table at the end converting, by oil percentage mind you, of all the hops used. So, feel free to use the standard German stuff or Liberty, Vanguard, Crystal, etc. Yeast – Since I wanted to see how the brown malt shook out I didn’t want to change the yeast up either. So I kept the same set of yeast. Nottingham or Fullers. Really enjoying the brew Wednesday series but can I just point out that it looks as though the imperial measures for 5 gallons is actually 5US gallons I.e. 19 litres. Thisappears to be the case as all weights in imperial convert directly to the metric under 19 litres. Just a warning! keep up the good work! Your map is of McKay's brewery, not Usher's. Usher's was on the other side of the road a couple of hundred yards up the road - by Parkside Terrace. 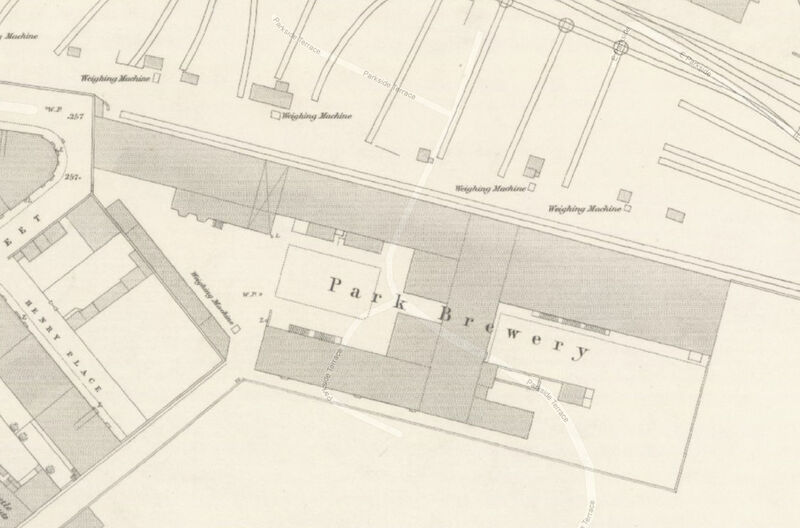 It was called the Park Brewery. This map shows location of Park Brewery. The building that is now Homebase was actually built by Usher's. Must have been a couple of years before it closed. half-man-half-pint, what was I thinking. I've several lists of breweries with them both on. St. Leonard's was indeed Mackay's. Thanks for pointing out my error. I've changed the image to be of the correct brewery. half-man-half-pint, I see how that Homebase fits right in. Correct. US gals, not Imperial. We went over that ages ago. Would it help if I changed the 19L to 22.7 whatnot liters? I asked a few buddies in the UK adn Europe and they said 19L was good for them. Either can be done, what do other people think? If you have to recalculate things that goes against what I'm trying to do. If there is a set 'liter' mark, I can set up the system to do that instead. Done. 5US gal. As for the liters, I've gotten a few emails about the size. I have people that do 19, 23, 25, 30. 23 being the UK Imperial gal equivalent. What is the most common? Hi Kirsten and thx for the reply. I think for the home brewer in the uk 23litres is near enough 5 imperial gallons and most common brewing set-up is 40 imperial pints as that is how most equipment I.e. fermenting vessels for homebrewing are sold. Can only speak for myself but I think we need to cleave towards those who may actually bother to brew the beers. Can I also beg you through Ron to ask if we can put all recipes in a separate section easily accessible after let's brew wednesdays and possibly some way of commenting /rating the brew after we have sampled. Many thanks again for a superb site to both of you! 23L it is. As for the recipes, blogshot is horrible for searching or such and such. My buddy wrote a separate web page/feed for the recipes and such. The same site also has all the info on invert sugar making. I'll chat with him and see if we can add a comments section on it as well. Sorry Kristen keep spelling your name wrong - my apologies!